C-Capture, the designer of world-leading chemical processes for carbon dioxide removal, has raised £3.5m in new equity funding in a round led by BP Ventures, Drax, and IP Group. The funding strongly underlines the credibility of C-Capture’s technology as the company positions itself to help mitigate climate change by providing systems that remove carbon dioxide emissions from power stations and cement, steel and aluminium facilities. Energy and clean growth minister Claire Perry has visited Drax Power Station’s bioenergy carbon capture and storage pilot plant, which uses technology developed by C-Capture. 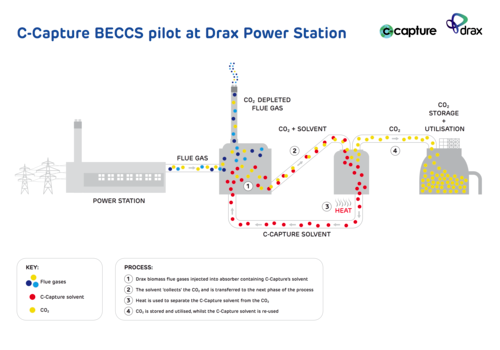 Further coverage of Drax power station’s announcement of work to commission its bioenergy carbon capture and storage (BECCS) pilot project, which is using technology developed by C-Capture. Also in Institution of Mechanical Engineers. In May, Drax power station announced a £400,000 pilot scheme to capture the gas produced from burning wood pellets. Drax has spent time working with energy firm C-Capture, the founder Professor Chris Rayner is quoted. The biggest power station in the UK has started a project working with energy firm C-Capture, to store carbon dioxide emissions and the gas could be used in the drinks industry. In May, Drax power station announced a £400,000 pilot scheme to capture the gas produced from burning wood pellets. L-R: Jason Shipstone, Head of R&D, Drax Group; Caspar Schoolderman, Director of Engineering, C-Capture Ltd; Andy Koss, CEO Drax Power; Prof Christopher Rayner, Technical Director, C-Capture Ltd; Carl Clayton, Research and Innovation Engineer, Drax Group. Drax has announced that it is to pilot the first bioenergy carbon capture storage (BECCS) project of its kind in Europe, which, if successful, could make the renewable electricity produced at its North Yorkshire power station carbon negative. The demonstration project will see Drax partner with Leeds-based C-Capture and invest £400,000 in what could be the first of several pilot projects undertaken at Drax to deliver a rapid, lower cost demonstration of BECCS. The first phase of the project, starting this month, will look to see if the solvent C-Capture has developed is compatible with the biomass flue gas at Drax Power Station. A lab-scale study into the feasibility of re-utilising the flue gas desulphurisation (FGD) absorbers at the power station will also be carried out to assess potential capture rates. FGD equipment is vital for reducing sulphur emissions from coal, but has become redundant on three of the generating units at Drax that have been upgraded to use biomass, because the wood pellets used produce minimal levels of sulphur. Unlike previous CCS projects Drax has been involved with, this is an early pilot for a new technology. It will examine the potential of a new form of carbon capture, post combustion on biomass, rather than coal. Chris Rayner, founder of C-Capture and Professor of Organic Chemistry at the University of Leeds, said: “We have developed fundamentally new chemistry to capture CO2 and have shown that it should be suitable for capturing the carbon produced from bioenergy processes.